Last year I spent a fair bit of time reviewing my understanding of foundational ideas and research that provide “us” (teachers and instructional designers) with guiding theories, principles, frameworks and guidelines to design “quality” programs, courses, lessons and learning activities. What I found was that, the closer I looked, the more it seemed as though there was no “best way” to recommend. The different ideas or theories each seemed to provide some value, in different learning contexts, for different learning outcomes, to address different kinds of knowledge or thinking/learning process. I tried to incorporate that perspective in a four week online design workshop I developed for BCcampus and provided a quick review of the major (persistent and/or supported by a significant body of evidence) theories, etc. I selected three design approaches for participants to select (constructive alignment/reverse design, design thinking for education, open education) and asked each of them to think about their own beliefs about teaching and learning and to try to identify the reasons for their choices in their project design. When we talked about facilitating, teaching, designing for online learners, we considered various perspectives on diversity. One major aspect of diversity that all educators seemed to be wrestling with is how to address the increasing diversity of cultural perspectives that students bring into online learning experiences. And, another challenging aspect identified by participants – how to deal respectfully and authentically with the issues of decolonization and “indigenizing the curriculum.” Although I had acknowledged diversity in my workshop design, I had sidestepped issues of decolonization, intercultural learning and indigenization, as I was uncertain how to address these issues meaningfully in a four week workshop. One of my participants was Donna Desbiens, an intercultural learning expert currently with Royal Roads University. She shared a recent journal article she had co-authored with Gail Morong “Culturally responsive online design: learning at intercultural intersections” The paper incorporates some thoughtful ideas about “internationalisation” and “indigenisation” and introduced me to some current thinking about “culturally competent facilitation” and “participatory intercultural learning”. Donna and Gail reviewed a wide range of research and provided some recommendations for learning design within online environments, from an intercultural and indigenous perspective. Their Culturally Responsive Online Design Guidelines list the “most critical research-indicated supports” and show how they can be integrated into course design. Although my main focus was to find new ideas for designing culturally sensitive (inclusive?) online learning, the article also introduced me to some new terminology and intercultural concepts that I’ll follow up over the summer to improve my understanding. Various references to AAC&U VALUE rubrics seem to indicate they could be a good place to start identifying ways to update our online facilitation practices as well. Review the treatment of quality/accessibility rubrics in FLO-Design workshop – find a simple way to introduce the basic tenets of intercultural learning and suggestions from Culturally Responsive Online Design Guidelines. Review the ideas and recommendations for creating culturally safe online environments and intercultural competencies in facilitation techniques – find a way to update “online community” and “collaboration” section in FLO-Fundamental workshop. Current thinking, as explained in Morong and Desbiens’ article is to clarify role of collaborative and cooperative work and allow space for individual learning and cultural contributions. Further exploration of “idiocultures” and potential impact on structuring and supporting online collaborative/cooperative groupwork or knowledge building. “5” forces me to share the most important (and potentially most useful) lessons. Most of the podcasting and video equipment guidelines recommend equipment that is out of my price range for the small number of introductory videos I make. I’ve captured decent video with my smartphone (Samsung) or with a reasonable quality ($60 Cdn) webcam. But what really helps, IMHO, is recording clear audio. I have a “Big Blue” Nessie Adaptive USB Condenser microphone. It does a good job at a reasonable price. There’s an app for everything these days – the free ones generally have limitations. Make sure you’re aware of them before you start recording. I’ve spent a lot of time reshooting videos when I found out the output formats were incompatible with the site or service to which I wanted to post the video. Converting can be fussy and result in unacceptable quality losses. I’ve started combining screenshots with straight video – means I have to pay more attention to these issues. I’ve created (and watched other people’s) rambling and unhelpful introductory videos. Set yourself a time limit and stick to it. For intro videos I suggest 3 minutes or less – or break up your video into different topics. Try not to refer to time or place information that might date your video. Although you don’t want to use the same intro video too many times, it is a real time-saver to have it ready to go when you teach the course again. Think about how to connect with your viewer – what will make them want to stay and listen/watch? First impressions can matter – what impression do you want them to take away from your short introduction video? I try for a blend of friendly – approachable – cheerful but still knowledgeable and trustworthy. Watch your phrasing, the intonation of your voice and particularly, the expression on your face. Try not to look too serious and don’t keep looking at your script as it can make you look shifty or harassed. Although I don’t need as many as I used to, I still need to record my introductions several times. I still fumble my words or find that I’ve misjudged the lighting or turned off the camera when I looked up or down so I look like a demented zombie. Take the time to get it right – even if it means taking a lot longer than you may have estimated. Make your video as visually appealing and watchable, as easy to listen to, and as useful to your viewer as possible. Size matters in video production. The format of your video (whether it’s avi, mp4, swf, wav, or other web format) and aspect ratio or dimensions (e.g., 512 x 288 or 640 x 360, etc.) matter in how easily you can upload it to a website or learning management system and, more importantly, how easily it plays back for your viewer. Read some of the general guidelines on the web or that are provided by your video recording/editing app. Test out a short sample before you really work on refining your content or presentation. I’ve learned so much through trial and error, although I still have more to learn. But hopefully, these 5 lessons will help you as you record your course introduction videos. Let me know if you have additional lessons to share. What exactly do we mean by “constructive” feedback? Do we actually model the behaviours we ask students to demonstrate? Do we provide clear explanations of what we expect? Do we provide constructive feedback when the students’ feedback is weak, superficial, slapdash? Do we scaffold our learners so they can consciously build and flex their critical thinking and collaborative or team-work skills? My reflections on constructive feedback were inspired by a random Twitter post f rom Howard Rheingold who shared a Diigo collection of links related to online facilitation. 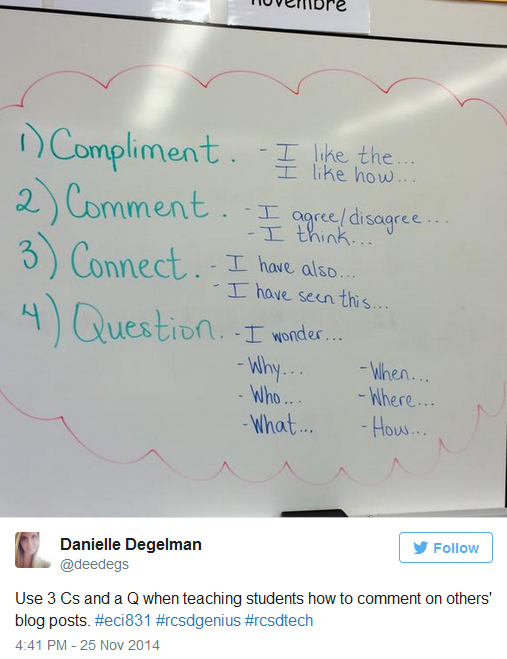 When I took a quick look a DS106 post on Constructive Comments caught my eye and, while scanning the article, I found an image tweet from @deedegs (Danielle Degelman 25 Nov 2014) Her visual list of the “3Cs and a Q” made me think about how I present, scaffold, model, promote constructive comments in my online facilitation. As the Facilitating Learning Online workshop has evolved, I’ve had the pleasure of co-facilitating with several dedicated, passionate faciliators who strive to explain, demonstrate and facilitate the importance of constructive feedback or comments. When I began facilitating FLO, the workshop had built in weekly opportunities for peer-to-peer group feedback (i.e., each week a team of participants would facilitate a learning activities for the other members of the workshop). At the end of each weekly “mini-session” or “short learning activity”, the facilitators would encourage participants (to share constructive feedback on their experiences with the team of facilitators). We explored a number of different starter posts in a shared discussion forum to clarify what we were looking for in terms of “constructive”. The participant feedback, and any responses from the facilitation team members is open to the class. _____________ (fill in the blank) really helped/supported my learning. My learning might have been better if ______________ (fill in the blank). What did the faciitators do that you really liked? What did the facilitators do that were challenging for you? What other kinds of facilitation strategies could the facilitators have tried, either as alternatives or add-ons? React (What did you think of the experience? What did you learn? Be specific but not judgemental – use “I” sentences. During the upcoming BCcampus FLO workshop that I’m co-facilitating with Leonne Beebe, I hope to explore different ways to emphasize the importance and critical thinking that is involved in providing truly “constructive” feedback – both through the use of different feedback structures, and by asking good questions to stimulate our participants to embed this approach in their learning and practice. 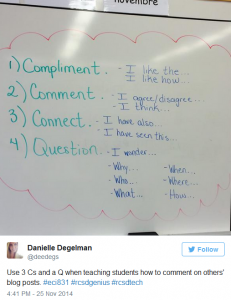 So, when you think about how you encourage your learners to provide “constructive” comments or feedback – what are the essential elements you emphasize? Losing the personal touch in online teaching? One of the best things (IMHO) about the Facilitating Learning Online workshop (offered regularly by BCcampus and Royal Roads University) is the emphasis we place on building a sense of community for learners and a sense of being “seen” by the instructor and other participants. Previous studies of the experiences of learners online highlighted the sense of isolation that they felt and the importance they placed on receiving timely feedback on their actions and assignments from instructors. I guess my concern is that so many of the new apps and tools are intended to take away the need to focus on our learners; to get to know them and to develop a relationship that is mutually respectful and provides support and encouragement at times and in ways that best suit each student. By automating that relationship we may ensure that we never miss responding to something that we pre-identify as expected and important but we may lose the unexpected opportunities to emphasize “learning moments” or suggest alternatives or simply acknowledge and praise our learners when they may need it most. 0 0 Sylvia Riessner Sylvia Riessner2016-08-13 07:42:422016-10-21 16:10:31Losing the personal touch in online teaching? Well, this blog post has been sitting in my Evernote notebook since the Festival of Learning in Burnaby this past June! The summer has just flown by! 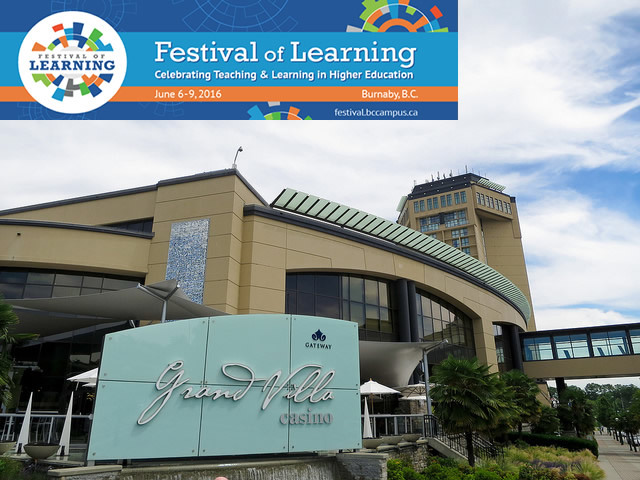 I had the pleasure of co-facilitating another “get the word out about FLO” conference session at a new professional learning event called “The Festival of Learning” (#FOL16) that took place June 6 – 9, 2016 at the Delta Villa Hotel in Burnaby, BC. Not to be confused with a similarly named event early in May, the June Festival was conceived by the BC Teaching and Learning Council and organized by BCcampus and a platoon (army?) of volunteers to offer an unprecedented range of learning and sharing opportunities for BC educators. Our quartet of FLO afficionados and practitioners: Beth Cougler Blom, Leonne Beebe, Sylvia Currie, Sylvia Riessner was offered a 3 hour time slot to explain the “power of FLO” and the potential the five week workshop offers to develop online facilitation skills (and the value of the FLO OER resources available for other institutions to develop their own “in-house” offerings). Although the 3 hours sounded generous at first, we quickly found ourselves scrambling to tighten up each section to ensure that we covered the important elements about the FLO workshop while still making the actual session interactive, engaging and useful for participants. We also integrated some Liberating Structures facilitation micro-structures (modified for constraints of time and space as we had a fairly awkward presentation room) – Impromptu Networking and Shift and Share AND shared a template for creating engaging and interactive online learning activities. 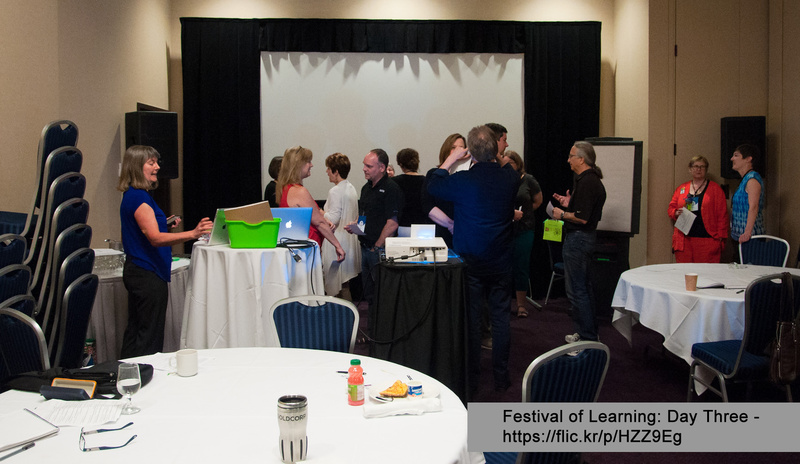 Our participants in the Festival session seemed surprised at the scope of the FLO workshop, curious about the OER resources available, and left with a “grab-bag” of ideas for addressing their own challenges around engaging learners online.